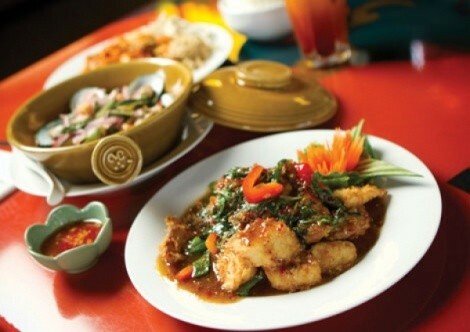 In the online restaurant listings on CityWeekly.net, there are 37 local restaurants serving Thai food. Indeed, platters of pad Thai are more ubiquitous here than an all-American hot turkey sandwich. One such restaurant that has garnered my attention over time is Tasty Thai, located just a short walk from Liberty Park. It’s a small, unassuming eatery where Nick and the rest of the staff dish out generous portions of warm friendliness and hospitality along with equally generous portions of delectable Thai cuisine—and now, wine and beer, as well. Moving the entrance of the restaurant a few feet remedied the no-booze hurdle of being located too close to Liberty Park to qualify for a beer and wine license, so you can enjoy a Singha Thai beer with your meal or a glass or bottle of wine from the small but functional wine list. The versatile Chateau Ste. Michelle Riesling is a wise option for many of Tasty Thai’s dishes, but especially the more incendiary ones. I have to admit that my initial impressions were not overwhelmingly favorable. For starters, I’m guessing no one really visits this restaurant for the décor or ambiance, which is wanting. In a space that was formerly the Bada Bean coffee shop, the original java shop’s brick counters are the only structures separating the kitchen from the dining room, the latter of which also seems to serve as storage space for boxes, glassware and such. I suppose if I were being generous, I’d call Tasty Thai’s an “exhibition kitchen,” but it’s only that by default. And, the first dish I tried—a steamed mussel appetizer—also failed to impress. Hoy obb ($6.99) is a small serving of a few, tough, overcooked mussels in a hot and sour broth, redolent of lemongrass and fresh basil, which couldn’t quite save it. Nothing wrong with the broth, but the mussels—those that were actually open, that is—were rubbery and unpleasant. Thankfully, I didn’t stop at the mussels. Three homemade spring rolls ($4.99) stuffed with minced chicken, carrot, cabbage and bamboo shoots came to the table scorchingly hot, direct from the deep-fryer, but once they cooled down were delicious, although served with a fairly routine sweet and sour sauce for dipping. I’m generally not a fan of fried spring rolls, but these were the bomb—the kids would love ’em. Another can’t-miss starter—even for children and other beings who might not be totally enthralled with Thai—is tod mun ($6.99), a serving of four fish cakes made with minced fish (tilapia, I think) and served in a mildly spicy red curry with cucumber relish and crushed peanuts atop. Dropping in for an early Friday evening dinner, we were treated to a pleasant surprise: live jazz in the form of a guitar and flute duo. I mostly abhor all things flute, but these guys were really good, playing a lot of standards like “All of Me” and “Autumn Leaves.” When, during a break, I asked who they were, the flutist replied, “We just came up with a name today: Guerrilla Jazz!” If you’re lucky, they’ll be playing when you stop by. It’s interesting to me that in America, certain things that are meant to merely supplement a meal—fried rice or potstickers, for example—often become the centerpiece. Fried rice is really just what the Chinese do with leftovers; you’d never order fried rice as an entrée in China. Ditto with pad Thai. My niece, who teaches school in Bangkok and is a first-rate foodie, says that pad Thai isn’t treated as a main course in Thailand. Indeed, the Thai people don’t sit down to eat big meals to begin with. Rather, they seem to eat all the time, continually nibbling on small portions—“grazing” if you will—at food stalls, at home and yes, in cafes and restaurants. But most of the noodle and rice dishes such as pad Thai are served in bite-size portions from carts and food stalls. That being said, Tasty Thai’s pad Thai ($6.99 to $11.99 depending on protein choice) will elate all pad Thai lovers, which is true of all the noodle dishes I sampled. My favorite noodle dish though is pad see ew, which is a platter of wide, thick rice noodles, cooked just this side of al dente, and sautéed in a dark soy-based sauce with eggs and broccoli. Equally appealing, in a somewhat lighter brown sauce, is lard na, which incorporates carrots and baby corn. The curries are predictably complex, and range from the thinner, brothy green curry (gang keow whan) that is more akin to soup than gravy, to rich, thick panang red curry, with the yellow curries landing somewhere in the middle. The curries are quite good and, blessedly, not too sweet. But, for a real treat, try one of the house specialties. Pla tod lard prik ($13.99) is heaven: Small pieces of tilapia filet are battered and fried to a beautiful crispy finish and served topped with a delicate Thai chili, basil and garlic sauce. The fish isn’t oily or greasy at all—just tender and delicious. Now, heat seekers, here’s one for you: One of the spiciest—and most satisfying, in a mostly masochistic way—dishes I’ve ever encountered is Tasty Thai’s larb salad ($7.99), a gorgeous mélange of minced, cooked ground beef tossed with diced red onion, mint leaves, ground rice powder and spicy lime juice. It’s spiked throughout with red Thai chilis. Seeing me sweat, our friendly server asked, “Are you OK?” I was more than OK; I was in heaven.